How can you be more different in the New Year? A friend recently told me of a practice he and his wife initiated when they go out to eat. When the food is delivered, they say to the waiter or waitress, “We are going to pray over the food. Is there anything we can pray about for you?” Then they hold out their hands to engage the server in prayer. One time a young waitress looked both ways and whispered, “No one knows this but my husband is in prison right now. Please pray for him.” They held hands with the young lady in tears and prayed quietly. That is being different. 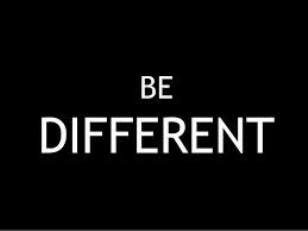 Be Different: “Now this is God’s will for you: set yourselves apart and live holy lives; avoid polluting yourselves with sexual defilement. Learn how to take charge over your own body, maintaining purity and honor. Don’t let the swells of lustful passion run your life as they do the outsiders who don’t know God.” – 1 Thessalonians 4:3-5. The swells of lustful passion disguise themselves pretty well. From the relational to the material, the world can pervert the perspective and the priorities of the Christian. Keep it simple: the perspective is eternal and the priority is relationship with Jesus the Christ. Put that to practice in every situation, discussion, decision and relationship, and it will be very obvious that there is something different about you. In My Utmost for His Highest Oswald Chambers writes, “In learning to walk with God there is always the difficulty of getting into His stride; but when we have got into it, the only characteristic that manifests itself is the life of God.” In His stride, the Light becomes too bright for the lustful passions of this world to have any influence. Prayer guide: Lord, thank You for the difference You have made in my life. Forgive me for when I have allowed the swells of lustful passion in this world to distract me. The selfishness and the temporal can be more attractive than selflessness and the eternal. I have coasted with the culture too long. The influence the world has had on me has outweighed the Kingdom influence I have had in the world. I repent. Grant me the strength and clarity to be different in this world, that I may be a stronger influence for You in every situation You have me in, especially in family and other circles of influence. Amen. A faithful father is different to the ways of the world and walks in stride with God.